The trailer for the dubiously titled documentary about former Alaska Gov. Sarah Palin hit the internet today, featuring testimony from the likes of Mark Levin and Andrew Breitbart. The clip for "The Undefeated" opens with moments from Palin's life interspersed by the words DAUGHTER WIFE MOTHER and WARRIOR, before an unidentified woman in a black leather jacket appears to aver that, "Like a Marine, she runs toward the danger." 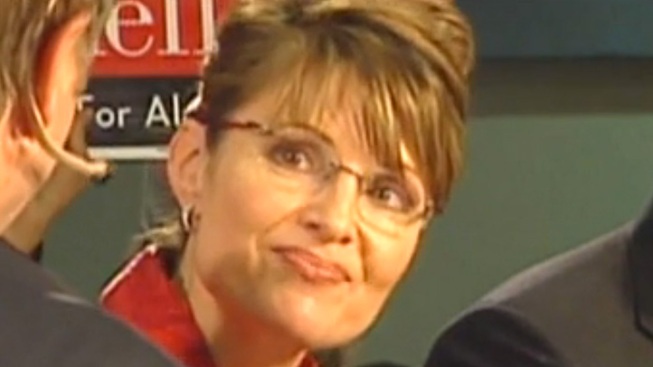 In a mere 20 seconds, the trailer leaves no question as to which side of the Great Palin Debate it lies. The film was made by documentarian Stephen K. Bannon, whose first film credit, ironically enough was as an executive producer on "The Indian Runner," which was written and directed by fervent lefty Sean Penn. Bannon first documentary was 2004's "In the Face of Evil: Reagan's War in Word and Deed," which set the tone for his new career. The film is structured in three Acts and chronicles Palin’s early days in Wasilla; her achievements as Governor of Alaska, which yielded her an astonishing 80 percent approval rating; and her meteoric rise to the national stage as John McCain’s running mate. Taking on both the right and the left, “The Undefeated” takes an unflinching look at the state of discourse in contemporary American electoral politics. With a sweeping score, previously unseen footage and exclusive interviews, “The Undefeated” educates, entertains and challenges its audiences to take another look at someone who is much-discussed but whose story, despite all that is written and said about her, is actually largely untold. "The Undefeated" will open in theaters across the country on July 15.